US equities saw a second day of gains, sp +7pts @ 2074. The two leaders - Trans/R2K, settled higher by 0.8% and 0.9% respectively. 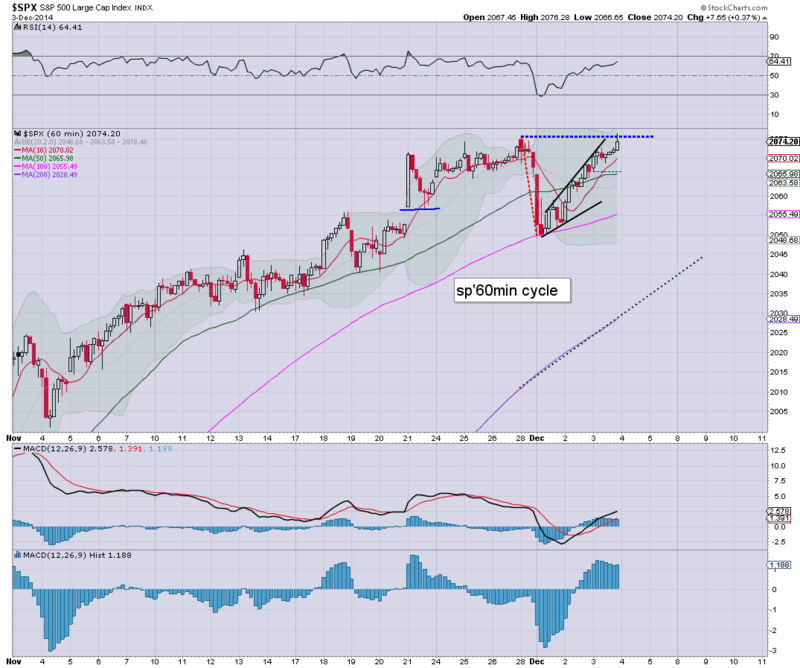 Near term outlook remains 'mixed'.. with the permanent threat of a retrace, whilst the broader trend remains very bullish. *notable new historic highs of Dow 17924 and sp'2076. ... and another day in market land comes to a close. Pretty tedious overall... tomorrow doesn't look promising for anyone wanting some dynamic price action. The only hope is that the ECB might cause an upset.... with a lower Euro.. higher USD.. and broader downside pressure on commodites. US equities look set to hold the gains built across the day. Price action is classic algo-bot melt mode... with a notable new high for the Dow. Metals are holding gains, Gold +$11. Energy prices remain weak, Oil -0.2%, whilst Nat' gas -1.8%. A pretty tiresome day... so much for the bear flag yesterday. Notable weakness, AMZN -3.1%. The irony on that one... since they lose on every sale.. the higher retail sales are this festive season... the more money they lose. CEO Bezos... remains the worse CEO in the western world. Congrats to the shareholders who keep him in command! 3.23pm... market continues in classic melt mode.... sp'2073... 2pts shy of the recent high. If Mr Market likes the jobs data this Friday.. the low 2100s are well within range... although I realise that will make the market pretty damn overbought again. The Fed beige book is due this hour, with another vain attempt to summarise the economy, and where it is headed. Meanwhile, the broader equity market is holding gains, with a VIX that continues to melt lower, -2.5% in the 12.50s. It remains a very subdued VIX, and now that its December - with quieter trading conditions, the VIX will be even more inclined to remain low. Yes... there is always the threat of a brief spike... but really.. such moves are overly difficult to time (next wave might not be until late January). As much as I'm moderately tempted.... 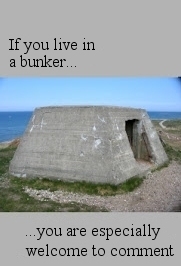 I ain't going long VIX. ...awaiting the book of Beige. 2.13pm.. Market merely takes in the Fed book... and translates to renewed algo-bot melt mode. That would seem to be how it'll be for the rest of today. 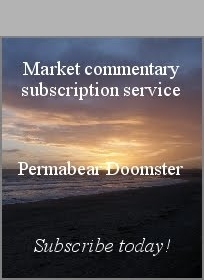 Next major issue.. the Friday monthly jobs data... market is seeking 230k net gains. 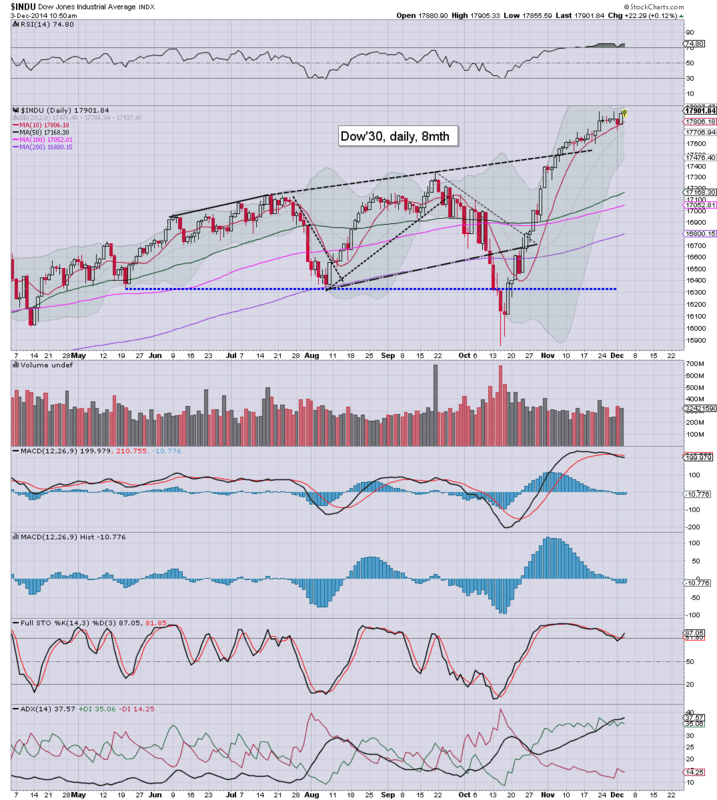 US equities remain broadly higher, with a notable new historic high for the Dow of 17905. 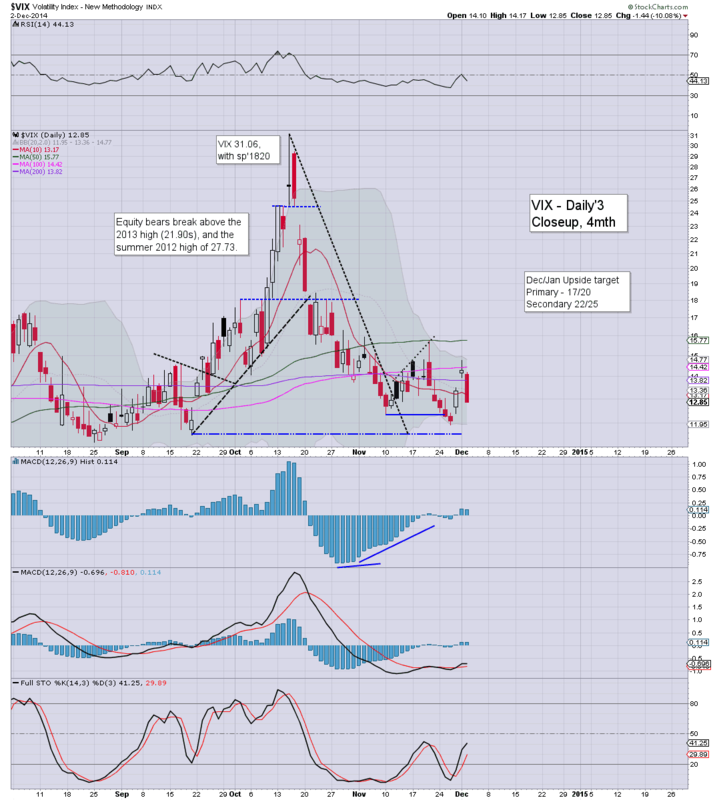 VIX remains crushed.. -2% in the 12.50s. Metals continue to slowly build gains, Gold +$12, despite the USD +0.3%. Oil has turned lower, -0.3%. Call it whatever you want, but this price action is particularly annoying. The Dow is teasing the bulls with a new high, but the Trans/R2K - despite gains, are still a fair way below the recent highs. Notable strength, FCX +3.7%, but like many other mining/energy stocks... FCX remains massively lower since the summer. *Back at 2pm.. for the Fed Beige book. 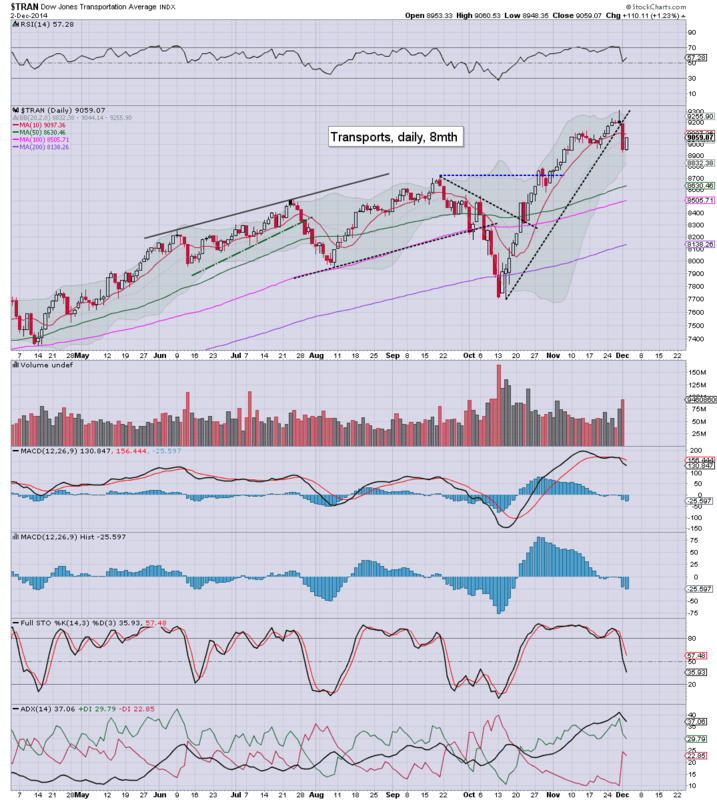 The mighty Dow has once again broken a new historic high.. now in the 17900s. 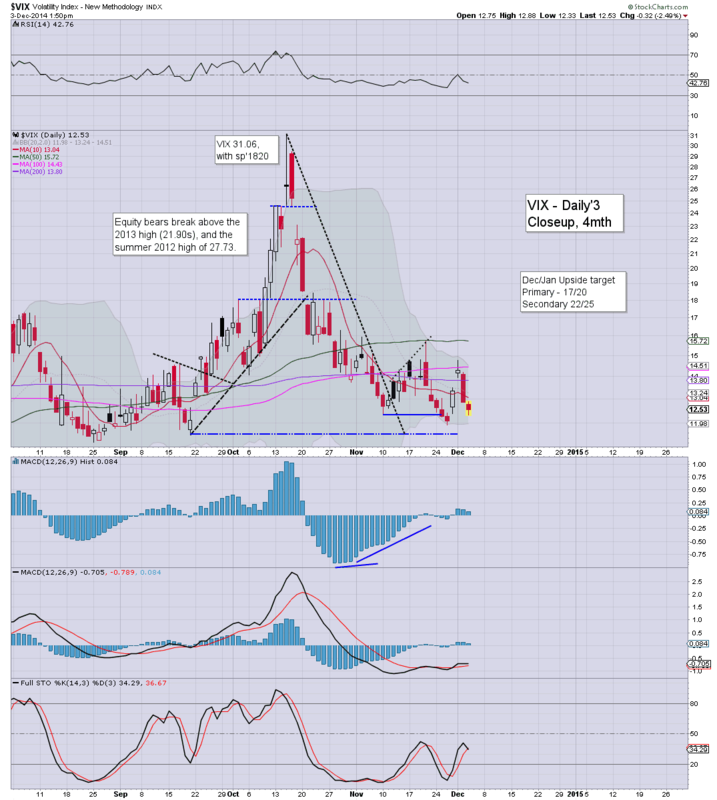 VIX remains in melt mode, -3% in the 12.40s. Metals are building gains, Gold +$11.. whilst Oil is moderately higher by 0.4%. Price action remains depressingly muted.. and that merely makes it easier for the market to grind higher. 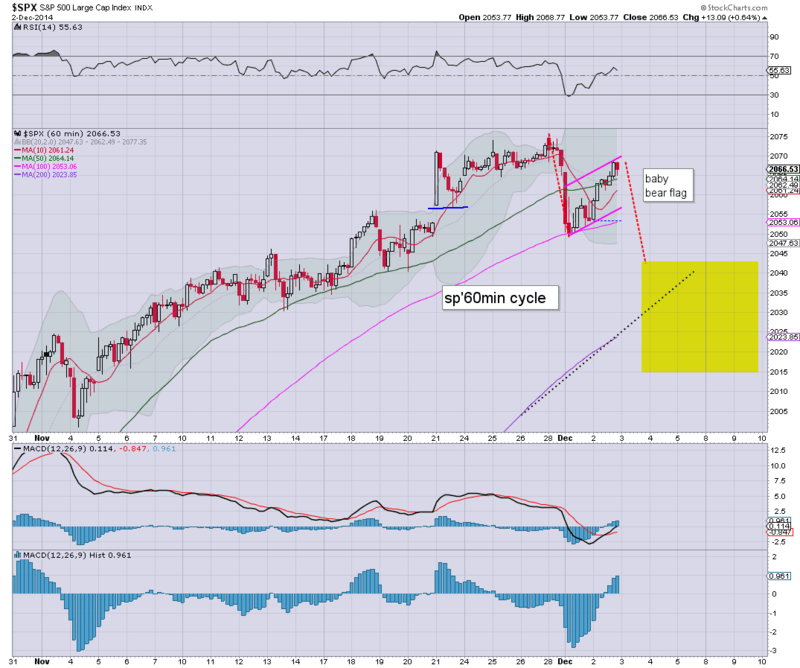 With the new high in the Dow - for the second consecutive day, even hopes of a retrace to sp'2020/15 are now back on hold. The Fed beige book is due at 2pm.. but really... what could that possibly say that might upset the market? Notable strength: RIG +4%, BTU +4%.. but then.. both stocks remain utterly smashed to pieces since the summer. Weakness.. airlines, ... DAL/UAL, both lower by almost -1%.. no doubt reacting to the minor bounce in oil prices. 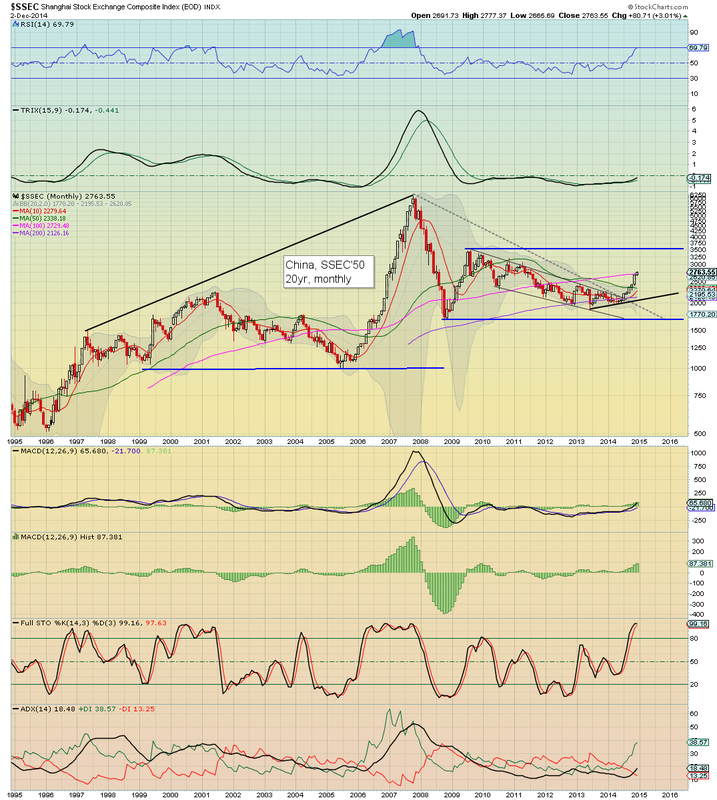 *I'll cover the USD in depth after the close, but the 89s.. are a VERY important level. The March'2009 high was 89.11.. after that.. its the 2005 high of 92s. So... we're a little higher...and frankly.. its getting tedious. Where the hell is even a basic retrace to 2020/00..or even 1980? .. and this is why I'll have no part in attempting index shorts in the near term.. waste of time.. and money. 10.01am ISM service sector 59.3... very reasonable number. Good morning. Futures are flat, we're set to open at sp'2066, a mere 9pts (0.4%) from the recent historic high. Despite the USD +0.2%, the Metals are bouncing, Gold +$6, whilst Oil is flat. Nat' gas remains weak, -1.5%. So.. we're set for a relatively muted opening. However, there is a lot more data to come.. along with the fed beige book at 2pm. 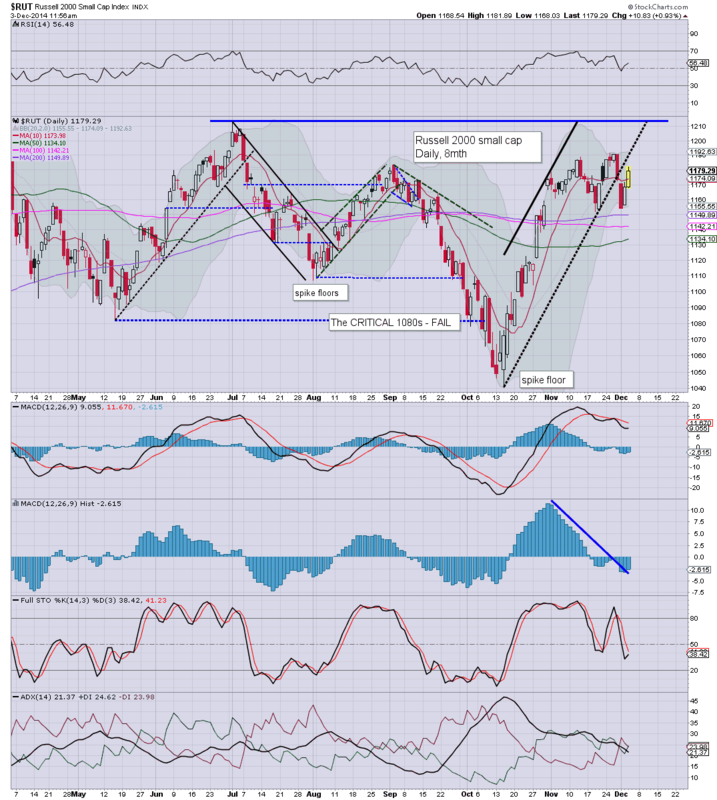 I realise the bear flag is 'borderline' at best... and with the Dow breaking a new historic high (if marginal) yesterday, the equity bull maniacs are clearly in full control of the short, mid, and long term trends. US equities saw a day of gains, with the sp +13pts @ 2066. 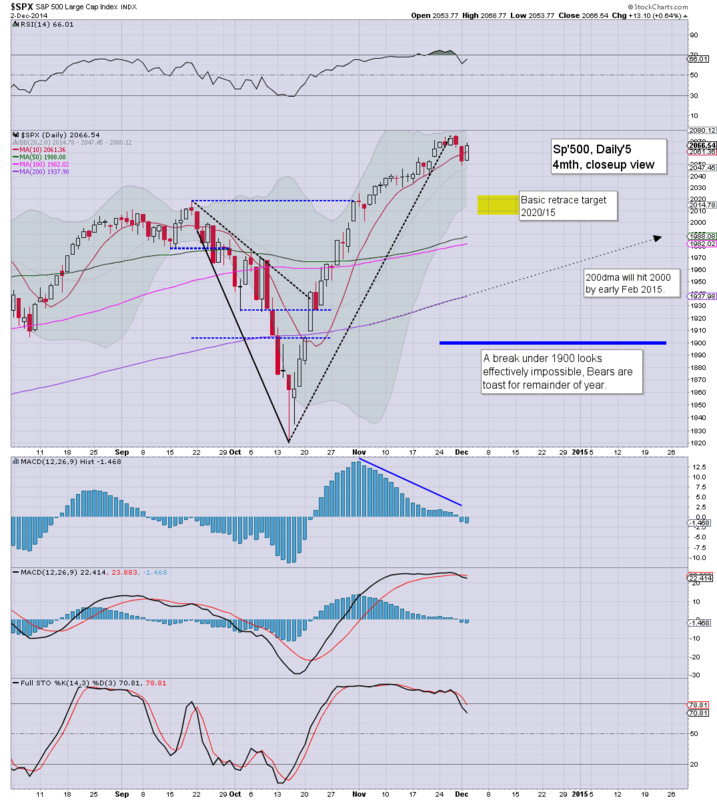 Regardless of any retrace in the near term... the sp'2100s are coming. Volatility remains crushed, -10.1% @ 12.85. Metals and Oil both remain broadly weak, not least pressured by King Dollar. With the market still in 'nothing to worry about' mode, the VIX remains extremely subdued.. and couldn't even the hold teens today, settling -10.1% @ 12.85. *there are two fed officials on the loose, along with Fisher speaking in AH. 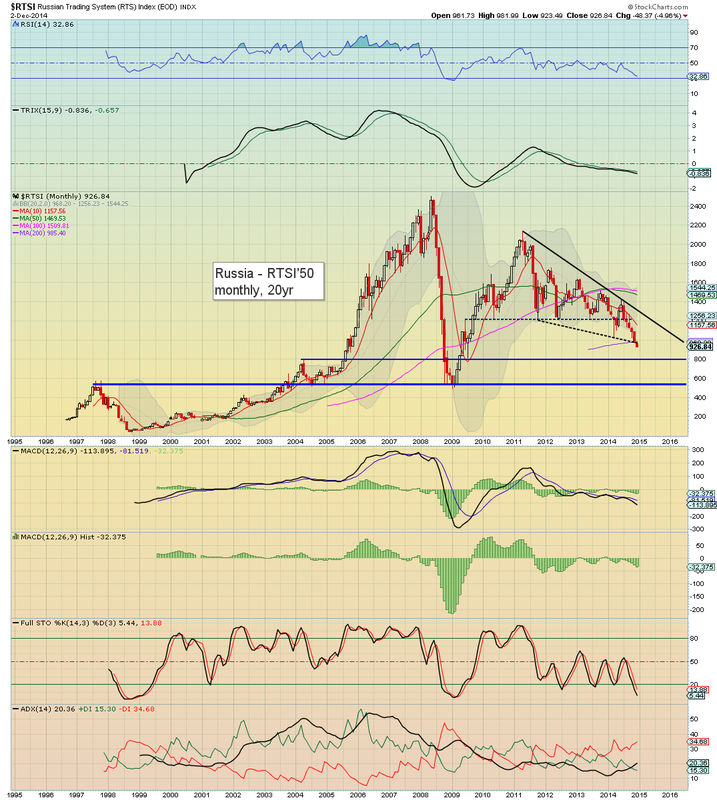 There are a lot of individual charts I'd like to highlight, but I'll end today with a look at Russia and China. The Russian market remains in meltdown... with a new multi-year low of 923. With the loss of the giant psy' level of 1000 in November, there really isn't any support until 800, and the RTSI is already lower by -5.0%, after just two trading days this month! Worse case, the mid 500s, which seems possible if Oil sees a secondary wave lower in second half of 2015. I would imagine President Putin is increasingly receiving some regular reminders from many around him about the state of the Russian stock market. On any basis, the Russian economy needs Oil consistently above $80... but that now seems unlikely next year. For the broader world economy though, lower Oil/energy prices.... Bullish! ...headed for the 3500 level. I really believe keeping an eye on the broader world equity markets can help put the US market moves in perspective.